Investigators for Louis J. Freeh continued to help state prosecutors for more than three months after they ended their work for Penn State, according to records from the state Attorney General’s office. Instead of cutting ties with law enforcement when he issued his report in July last year, Freeh’s firm continued to assist the attorney general’s office with building a criminal case against former Penn State employees through October, a series of e-mails obtained in response to a Right-to-Know Law request show. The exchange chronicles a call for help the night before prosecutors charged former university president Graham Spanier on Nov. 1. It was so urgent, lawyers couldn’t wait for a senior Freeh investigator to wrap up his trip overseas. The e-mails raise new questions about the independence of private investigators who were hired to figure out why allegations of child abuse against Jerry Sandusky went unreported at Penn State in 2001. The $8 million Freeh Report concluded Spanier, former athletic director Tim Curley, former vice president Gary Schultz and the late coach Joe Paterno knowingly covered up Sandusky’s abuses. But critics say Freeh’s conclusions aren’t supported by the facts. They wonder why veteran investigators built a scathing report based on evidence that could easily lead to different conclusions. But even though Freeh closed his case with Penn State, his investigators continued to work with prosecutors. On Oct. 31, prosecutor Frank G. Fina, who led the team that convicted Jerry Sandusky, urgently called Greg Paw, a senior Freeh investigator who was out of the country. Whatever Fina needed, it couldn’t wait. “Can I call quick now?” Fina asked in another e-mail. It’s unclear if Fina ever spoke with Paw, or what the topic may have been. But the next day, the Attorney General’s office filed charges against Spanier for what they say was his role in covering up Sandusky’s crimes. It also added new charges against Curley and Schultz who were already accused of the same offenses. After Spanier was charged, Fina reached out to Paw again. “Greg, when you get back to the U.S. and have a moment, could Rick and I meet/talk with you?” he said in a Nov. 2 e-mail. The Attorney General’s office withheld an unknown number of other records that detailed correspondance between prosecutors and Freeh’s team. That decision is under appeal. The latest e-mails follow others released in March that showed Freeh investigators celebrating Sandusky’s conviction. “It was my pleasure to have an opportunity to work with you on this matter,” Paw wrote in an e-mail. In announcing his findings, Freeh called his firm’s work “independent,” but “done in parallel with several other active investigations.” His investigators “continuously interfaced and cooperated” with law enforcement agencies, Freeh said. But the e-mails show prosecutors relied on Penn State’s own investigators to help build their case, and detail a much closer relationship than Freeh described during his announcement. Under the terms of Freeh’s contract with Penn State, investigators were subject to attorney-client privilege and couldn’t provide information to prosecutors without university approval. But when the privilege is waived, Penn State is obligated to foot the bill for any cooperation with law enforcement agencies. It’s unclear if Freeh’s team got approval from university officials before talking to prosecutors after the report was released. 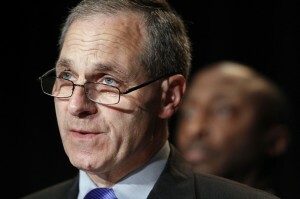 But in May, Freeh’s firm sent Penn State a bill for $9,424, according to the Centre Daily Times. Keep up the great work. Truth will prevail. While I’m sure there’s some funny business going on, I fail to see how these emails prove anything. How many pedophiles are on the BOT? Must be quite a bit if they’ve chosen to destroy the university over this. This is all so ridiculous. I firmly believe Jerry Sandusky was framed by the media, politicians and lying men who embellished their stories for money. When the truth does come out….the justice system will never be the same. We should all be appalled at what happened in this supposed scandal.